Cholesterol, Coronary Artery Disease/Coronary Heart Disease, Heart Attack / Myocardial Infarction, Hypertension, TIPSS, BRTO and portal hypertension . 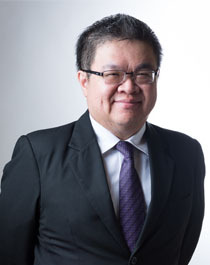 Graduated from NUS Medical school in 1999 and completed Basic Internal Medicine Training in Singapore in 2005 before subspecialising in Cardiology. Completed Cardiology training in 2008 and awarded HMDP for Interventional Cardiology training in Australia (2010). Served at Changi General Hospital since 2001 and promoted to senior consultant in 2017. Appointed as Visiting Consultant at National Heart Centre since 2012. Currently serving as the most senior interventionist in CGH and Director of the CGH Cardiac Catheterization Lab.